Famously referred to as an 'Axis-of-Evil' country, North Korea remains one of the most secretive and mysterious nations in the world today. A series of manmade and natural catastrophes have also left it one of the poorest. 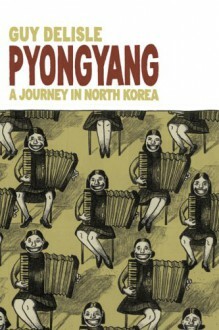 When the fortress-like country recently opened the door a crack to foreign investment, cartoonist Guy Delisle found himself in its capital Pyongyang on a work visa for a French film animation company, becoming one of the few Westerners to witness current conditions in the surreal showcase city. Armed with a smuggled radio and a copy of 1984, Delisle could only explore Pyongyang and its countryside while chaperoned by his translator and a guide. But among the statues, portraits and propaganda of leaders Kim Il-Sung and his son Kim Jong-Il - the world's only Communist dynasty - Delisle was able to observe more than was intended of the culture and lives of the few North Koreans he encountered. His astute and wry musings on life in the austere and grim regime form the basis of this remarkable graphic novel. "Pyongyang" is an informative, personal and accessible look at an enigmatic country. Aww man. Completely disappointing. Review to come.